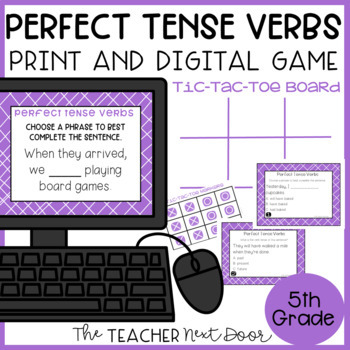 This Perfect Tense Verb Game will give your students an engaging way to practice using perfect verb tenses correctly in a fun tic-tac-toe game format. The Perfect Tense Verb Game works well as a language center, for whole class games, for test prep, for one on one, and more! SAVE MORE and GET MORE with the 30 Grammar Games Bundle for 5th Grade!!! (Click Here). This bundle covers ALL 3rd Grade GRAMMAR STANDARDS! The game is also included in the 10 Grammar Games Bundle Set 1 for 5th Grade! This grammar game is carefully aligned to cover the specific GRAMMAR STANDARD! This grammar game gives your students concentrated practice in a format that seems more fun than traditional grammar worksheets. Your students will enjoy playing this game! Materials are easy to prep and to organize. This game has a fun tic-tac-toe game format with 32 task cards. There are editable directions, so you can decide how you'd like your students to play. 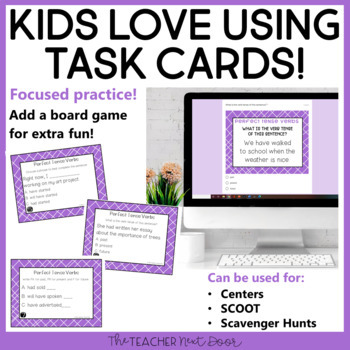 There are so many ways to use this grammar game from literacy centers, whole class game times, one on one work, exit slips, test prep, and more!!! Want to try a FREE Grammar Game? 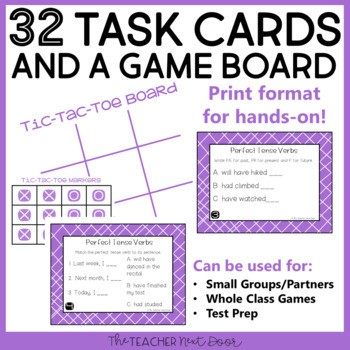 This FREE Titles of Works Game has 32 task cards and a board game format your students will enjoy!!! Looking for more grammar practice? This 5th Grade Morning Work includes all standards for language, reading, and math. Plus it has science and social studies. All standards spiral throughout the year! 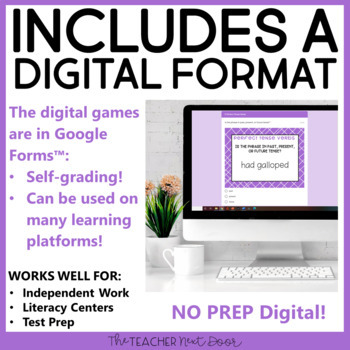 Need more 5th grade learning games? Finally, if you like my work, I would love for you to follow me by clicking on the green star above. Purchasing this product grants permission for use by one teacher in his or her own classroom or for one homeschool parent teaching his/her child. If you would like to share with others, please purchase additional licenses.